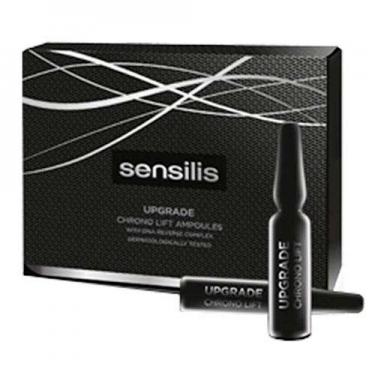 DESCRIPTION: Upgrade Chrono Lift Ampoules from Sensilis is an intensive rejuvenating treatment that, thanks to its content of ferulic acid and glycoproteins (precursors of proteoglycans) and the power of genomic technology that protects cellular DNA, exerts a moisturizing, antioxidant and firming action that fights skin aging. Thanks to its immediate tensile effect, it smooths wrinkles and lines of expression, refines and redefines the oval shape of the face and increases the luminosity. With high technology natural ingredients. No parabens. No assets of animal origin. 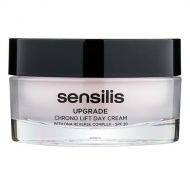 Apply before the usual cream once or twice a day on the face, neck and décolleté to favour its absorption.